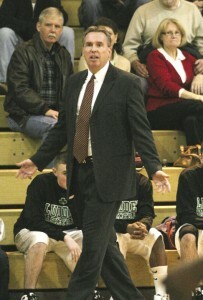 Bishop Ludden Coach Pat Donnelly has over 400 wins to his credit. The road to being the varsity basketball coach at Bishop Ludden was a natural one for Pat Donnelly, and, through victory and defeat, Donnelly has remained a steadfast presence on the Bishop Ludden court. Donnelly graduated from Ludden in 1976 after playing on the varsity team in 1975 and 1976 and leading the team to the Section III Championship as captain. He continued his basketball career at SUNY Potsdam, where he played from 1977 to 1980 and captained the 1980 team. During his days at Potsdam, his team was the NCAA Division III Eastern Regional Champion twice (1979 and 1980) and was in the NCAA Division III Final Four and National Runner-up in 1979. Upon graduating from Potsdam with a degree in economics, Donnelly began his coaching career, starting with the East Syracuse Minoa junior varsity team and moving to the varsity two years later. In 1987, Donnelly returned home to Bishop Ludden and has been there ever since, compiling an overall record of 419 – 194, with 11 Onondaga High School League (OHSL) championships and eight Section III championships. Donnelly coached the Ludden team to seven consecutive Section III Championships from 1993 to 1999 — a league record — and, in 1994, Bishop Ludden won the New York State Public High School Athletic Association (NYSSPHSAA) State Championship, one of the highlights of his career. Along the way his teams also have won two NYSPHSAA regional championships and been in two NYSPHSAA Final Four tournaments. In 1994, Donnelly was named the NYSPHSAA Coach of the Year and in 1999 he was named the CNY Coach of the Year. And recently, in 2009, he and the Ludden team celebrated Donnelly’s 400th win as the varsity team defeated East Syracuse Minoa. Although he is the basketball coach, his goal for his young players extends beyond the court. Donnelly’s goal is to help prepare young men for life beyond Bishop Ludden, so he makes a point to get acquainted with the players’ families and get to know each of his players as individuals. He believes in reinforcing their parents’ rules, emphasizing the need for academic excellence in addition to athletic prowess, and, most of all, teaching his players to have integrity in all life situations. When he’s not on the court, Donnelly also is employed with National Grid (formerly Niagara Mohawk), where he has worked for 29 years in the commercial and industrial energy efficiency services. Over the years, Donnelly has been offered opportunities to leave Bishop Ludden and coach at other schools, but he has chosen to stay with his alma mater and continue on in the proud tradition of the Gaelic Knights. When asked to explain why he remains committed to Ludden the answers come easily — Bishop Ludden is family. While Donnelly and his siblings graduated from Ludden, he also has found family in the players he has coached throughout the years, and he continues those relationships with his players far beyond graduation. This summer Donnelly, and his wife Lori, attended four weddings of former players, and they regularly are invited to weddings, christenings, parties, golf outings and other milestones with the men whose character he helped shape. “Seeing my players succeed in life is the best part of my job as coach,” Donnelly said. Maria Walsh is the development director at Bishop Ludden Junior/Senior High School.